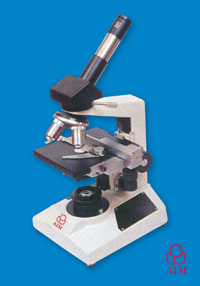 A unique research monocular 45 deg. 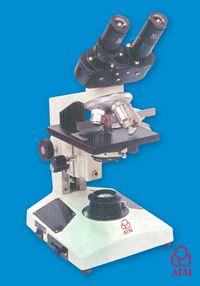 Inclined microscope rotatable through 360 deg. With adjustable locking device. The Head is interchangeable with Binocular or Trinocular head as optional. Single piece die cast arm & large size rectangular, heavy base fitted with Transformer & electricals. Quadruple revolving nosepieces, built in graduated coaxial mechanical stager (size 135mm x 120mm) for easy slide manipulation & focusing by vertical movement of stage, coarse adjustment by rack pinion & fine sensitive focusing by screw lever reading to 0.002mm. Bright field, Abb's N.A. 1.3 condenser with iris-diaphragm & filter holder, focusable by rack-pinion, Illumination by 6V - 20W Halogen lamp fitted under the field lenses operated through transformer. Mirror attachment is also provided (for day light working). Supplied with dust cover, duster, filter & operating manual in wooden container with lock & key. 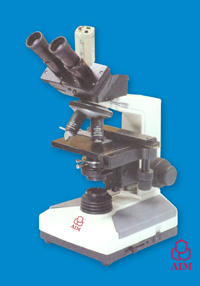 An advanced Binocular 45 degree or 30 degree inclined model rotatable through 360 degree with well in take locking device. The head is interchangeable with Trinocular head or vertical photo tube for microphotography as optional. Single piece die cast arm & large size rectangular, heavy base fitted with Transformer & electricals. Quadruple revolving nosepieces, but built in graduated coaxial mechanical stage (size 135mm * 120mm) for easy slide manipulation & focusing by vertical movement of stage, coarse adjustment by rack pinion & fine sensitive focusing by lever reading to 0.002 mm. Bring field, Abb's N.A. 1.2 condenser with iris- diaphragm & filter holder, focusable by rack-pinion. Illumination by 6V -20W Halogen lamp fitted under the field lenses operated through transformer. Mirror attachment is also provided (for day light working). Supplied with dust cover, duster, filter & operating manual in wooden cabinet with lock & key. 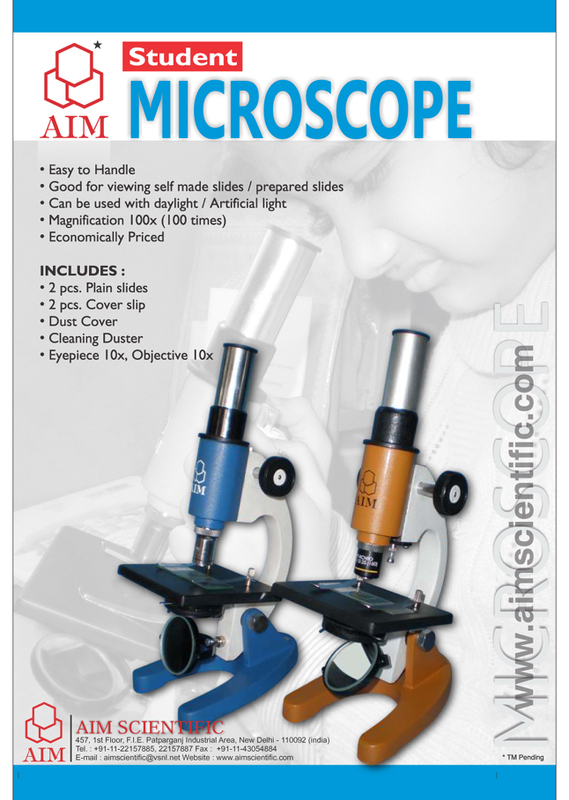 An advanced trinocular 45 degree inclined microscope with observation tubes, rotatable through 360 deg.& adjustable in any direction with a clamp screw. Interpupillary distance & diopter is adjustable. Right hand slide lever provides 100% light to Binocular head or vertical photo tube. Single piece die cast arm & large size rectangular, heavy base fitted with transformer & electricals. Quadruple revolving nose-pieces, built in graduated coaxial mechanical stage (size 135 * 120 mm) for easy slide manipulation & focusing by vertical movement of stage, coarse adjustment by rack-pinion & fine sensitive focusing by screw lever reading to 0.002 mm. Bright field, Abb's N.A. 1.3 condenser with iris-diaphragm & filter holder, focusable by rack-pinion. Illumination by 6V - 20W Halogen lamp fitted under the field lenses operated through transformer. Mirror attachment is also provided (for day light working). P 6x or 7x for microphotography. Supplied with Vinyl cover, duster, filter & operating manual in wooden cabinet with lock & key. With ball bearing quadruple nosepiece having positive click stop, coarse motion with universal locking device, sub stage Abbe Condenser N.A. 1.2 with iris-diaphragm & fitting holder, builtin co-axial mechanical stage both sides graduated for slide manipulation, straight tube for photomicrography. With ball bearing quadruple nosepiece having positive click stop, coarse motion with universal locking device, sub stage Abbe Condenser N.A. 1.2 with iris-diaphragm & fitting holder, builtin co-axial mechanical stage both sides graduated for slide manipulation with binocular head, straight tube for photomicrography.